Sometimes I run across things I really enjoy and it's always heartbreaking to not be able to find them again. In this day of the internet, sometimes you can find things again. I find this awesome - and heart mending. One of the heart-mending things I have discovered is Blue Bell ice cream. In Ohio. Oh yes! Outback Steakhouse uses Blue Bell ice cream. And one time when the manager visited our table I told him how wonderful it was to have a taste of it in Ohio. He offered to let me order it from them. You have to order the big three? three and a half? gallon size. But who cares!? It's Blue Bell Ice Cream! And the cost is quite reasonable for the amount of ice cream you are getting. I think it's $25. Alternatively, you can get Blue Bell to ship straight to your house at the price of $129 for four half gallons. If Homemade Vanilla is what you want, your local Outback Steakhouse manager is your new BFF, saving you literally hundreds of dollars on ice cream! Another heart-mending thing is Dunroven House Direct. Our little town had this amazing Ace Hardware which carried great quality stuff. One of the things it carried was really nice tea towels. I require a certain kind of towel in the kitchen, and most towels you can buy just don't cut it. Even Williams-Sonoma towels, when you buy an assorted package, are only half okay. One kind is great, but the other kind gets wonky when you wash it. No bueno. These are lovely and stay nice forever. Their prices are fantastic and there is never a shipping charge. But wait until you taste it! There are not sufficient words to describe the experience. You will just have to try it for yourself. I've always been a fan of the Roman Raspberry, Lisbon Lemon, Caramel Cookie Crunch, and their Caramel Apple Pie is so good I'm tempted to use words like 'Amaze-balls', but I really don't talk like that. You're welcome. I see they are selling some of their flavors in quarts now, too! (Yes, this is exciting for me.) I hope they make their way to places I shop, soon. They have a lot more delicious flavors. I'm sure you will find one/s you love. *Their containers are great for saving, too. We have used them for everything from storing a pint of paint to carrying individual cupcakes to very special people. You know what would probably go great with some of this Talenti? I think the Tahitian Vanilla would be complemented greatly by Ilene's "Granola so Great I would share it with God - if I could." Hippie Chick Granola is what all granola should taste like, but no other granola does taste like. You're welcome. Reminder: Don't forget the seven places you should be shopping online. Heart-mending frozen things have top the list! But replacement rings, no, maybe that is the best. I know how you grieved over the loss of those very special rings. Oh, and save the Talenti jars for King's Acres! They would be great for freezer jam! Who can understand the tears sometimes. I can't. I want to try this. You're selling it big time for me. I don't say "amaze-balls" either. Ever. But I would probably do that for Talenti. Share it with God if you could? So...that left me kind of speechless. 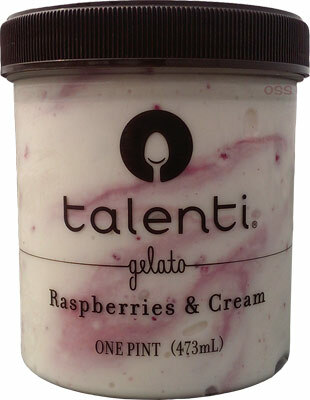 And now I'm dying to try some Talenti. I've never had it before! I love your list of favorite things...that Talenti gelato is fantastic, isn't it? And congrats on your new rings!